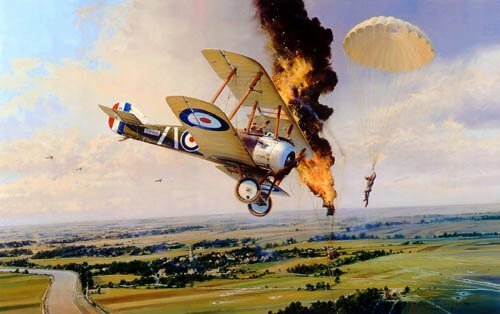 Flying a Sopwith Camel with RFC Squadron 208, Flight Lieutenant Henry Botterell brings down a German observation balloon near Arras, Northern France, August 29, 1918. Botterell acknowledges the observer with a chivalrous salute before departing the scene. Each print signed in pencil by First World War pilot Henry Botterell - the last surviving fighter pilot from the Great War.